Diddy And The Brooklyn Nets Honor Notorious B.I.G. Diddy helped the Brooklyn Nets honor Notorious B.I.G tonight at their game versus the New York Knicks. The game was dubbed #BiggieNight in remembrance of the 20th anniversary of Biggie's death and in celebration of his legacy. 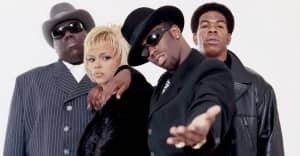 At half time, Diddy, with Biggie's family and friends, retired B.I.G. 's jersey #72. The jersey will hang at Barclays Center permanently. Before the game, Biggie's mother, Voletta Wallace, thanked the crowd for honoring her son. It was her first professional basketball game, she said. Check out photos and a video of the unveiling by Billboard and others below.